Three illustrations from Robert Fludd‘s History of the Macrocosm and Microcosm (Utriusque Cosmi, Maioris scilicet et Minoris, metaphysica, physica, atque technica Historia, 1617—1621), as reprinted in Joscelyn Godwin’s summary of the same. “The Great Darkness. ‘And thus, to infinity’” (p23). 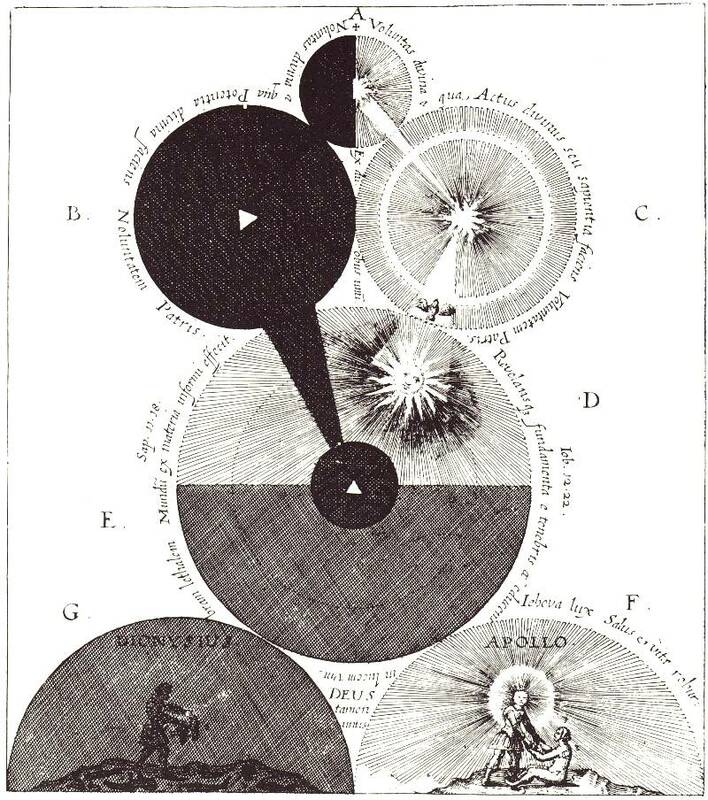 A picture of pre-creation or un-creation, of materia prima, or Paracelsus‘s Mysterium Magnum. “Let there be Light” (p25). From FIAT (“let it be”), the Spirit of God (the dove) creates the three realms of the universe by radiating its divine light in three revolutions: empyrean (the well-lit Heaven of the angels), ethereal (the crossroads of spirit and matter, domain of stars and demons), and elemental (dark home to man and plant). “The Primeval Duality” (p30-1). Click image for larger version. 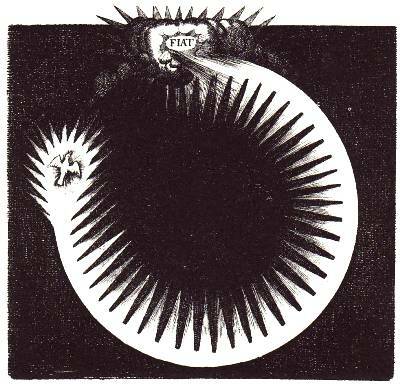 Three emblems from Andrea Alciati‘s Emblematum Liber (1549 edition), recently translated by John F. Moffiit. “The term ’emblema’ was frequently taken by Alciati’s contemporaries to represent the modern equivalent of the ancient hieroglyphs, for these also combined an enigmatic image with a mostly inscrutable text” (Moffit’s introduction, p7). Or, as Alciati’s teacher Filippo Fasanini described them, “short sayings… which can, in combination with painted or sculpted figures, wrap in shrouds the secrets of the mind” (p6). 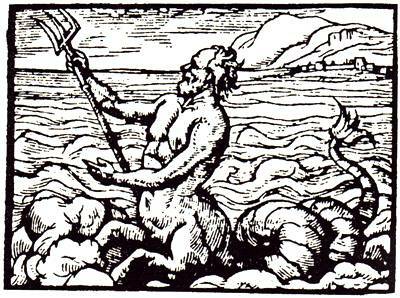 In Emblematum Liber, Alciati encoded 212 such emblems with moralistic allegories, lessons, histories. States Epicharmus: “Never be credulous nor cease to be sober.” These are the sinews and members of the human mind. 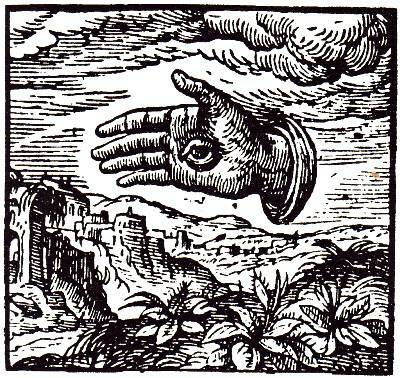 Behold the hand with an eye upon it; it only believes what it sees. 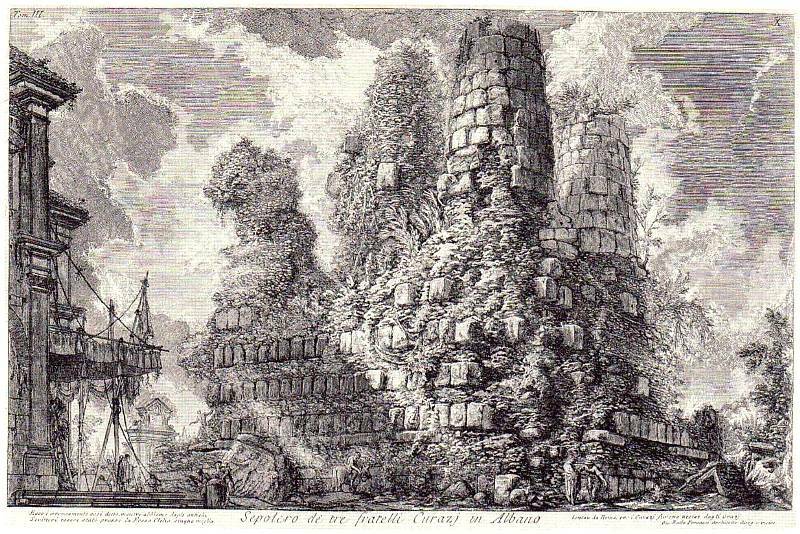 Here is shown the mint, the herb symbolizing ancient sobriety. 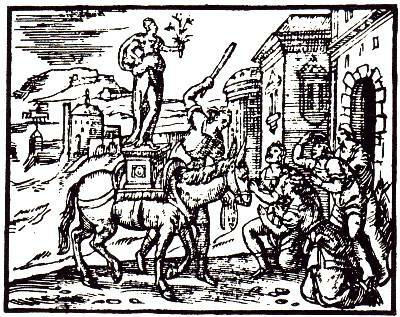 Brandishing this plant, Heraclitus pacified and soothed the maddened mob bursting into frenzied revolt. 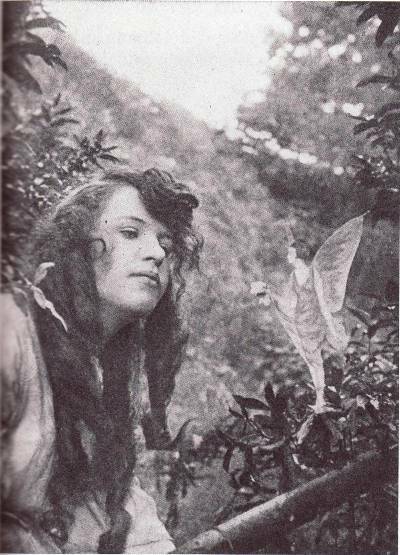 Three photographs of the The Cottingley Fairies, as described in Arthur Conan Doyle‘s The Coming of Fairies (1922), recently reissued by Bison Books. 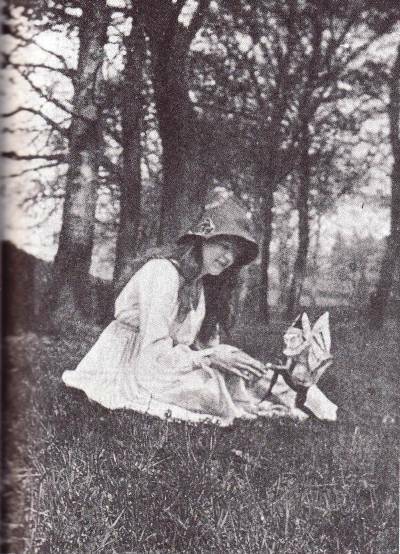 These photographs were taken by two girls (10 and 16 years old) in 1917, and subsequently defended by several as proof of fairies—including Doyle, who was evidently influenced by his interest in the Spiritualism and Theosophy movements. “The recognition of their existence will jolt the material twentieth-century out of its heavy ruts in the mud, and will make it admit that there is a glamour and a mystery to life” (p58). “To the objections of photographers that the fairy figures show quite different shadows to those of the human our answer is that ectoplasm, as the etheric protoplasm has been named, has a faint luminosity of its own, which would largely modify shadows” (p53). Doyle quotes C. W. Leadbeater: elemental fairies (being one type of fairy) “are the thought-forms of the Great Beings, our angels, who are in charge of the evolution of the vegetable kingdom. When one of these Great Ones has a new idea connected with one of the kinds of plants or flowers which are under his charge, he often creates a thought-form for the special purpose of carrying out that idea. It usually takes the form either of an etheric model of the flower itself or of a little creature which hangs round the plant or the flower all through the time that the buds are forming, and gradually builds them into the shape and colour of which the angel has thought. But as soon as the plant has fully grown, or the flower has opened, its work is over and its power is exhausted, and, as I have said, it just simply dissolves, because the will to do that piece of work was the only soul that it had” (p187/8). 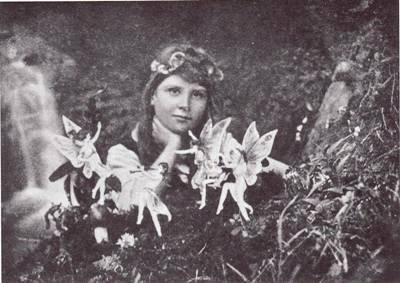 Finally, in a 1981 interview (some 60 years later), the girls (then women) admitted they fabricated the fairies by tracing pictures from Princess Mary’s Gift Book (1914). 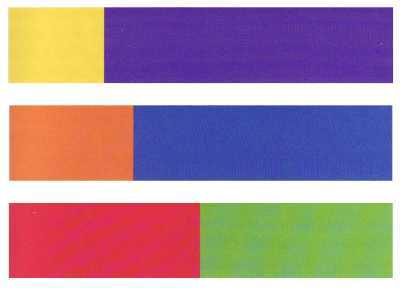 Three figures from Johannes Itten‘s The Elements of Color, 1961. 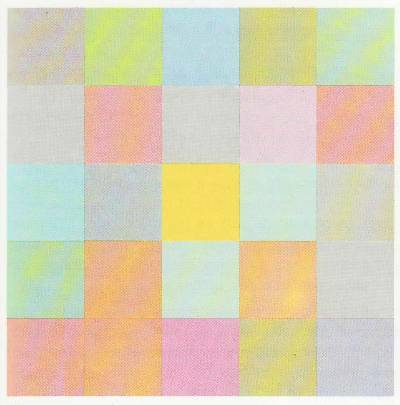 “Colors of equal brilliance” (p39). “The doctrine to be developed here is an aesthetic color theory originating in the experience and intuition of a painter. For the artist, effects are decisive, rather than agents as studied by physics and chemistry. Color effects are in the eye of the beholder. Yet the deepest and truest secrets of color effect are, I know, invisible even to the eye, and are beheld by the heart alone. The essential eludes conceptual formulation” (p7). “Combinations showing how the same blue… [is] altered in expression by different juxtaposed colors” (p87). “Symbolism without visual accuracy and without emotional force would be mere anemic formalism; visually impressive effect without symbolic verity and emotional power would be banal imitative naturalism; emotional effect without constructive symbolic content or visual strength would be limited to the plane of sentimental expression” (p13). 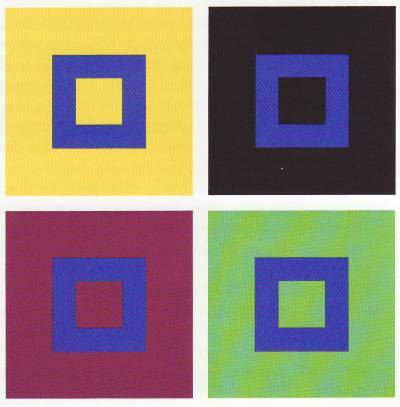 “Harmonious proportions of areas for complementary colors” (p60). “Doctrines and theories are best for weaker moments. In moments of strength, problems are solved intuitively, as if of themselves” (p7). 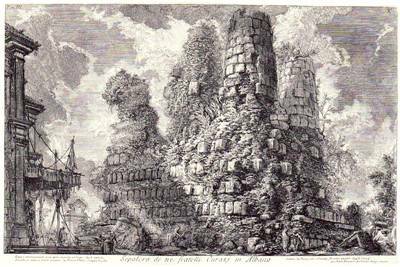 Three etchings by the antiquarian artist Giovanni Battista Piranesi (1720—1778), reprinted in Luigi Ficacci’s Taschen edition. Remains of the tomb of the Metelli. Click image to view larger version. 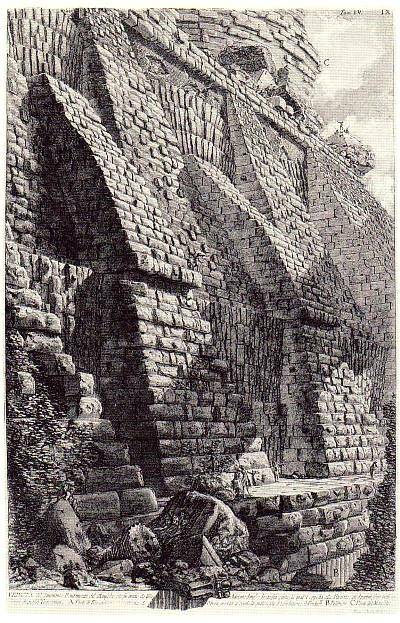 “When he can devote himself exclusively to ancient Romain remains, his style fully realizes the visionary originality that… he dedicated to representation of the ancient monuments” (p22). View of the subterranean foundation of the mausoleum. Click image to view larger version. 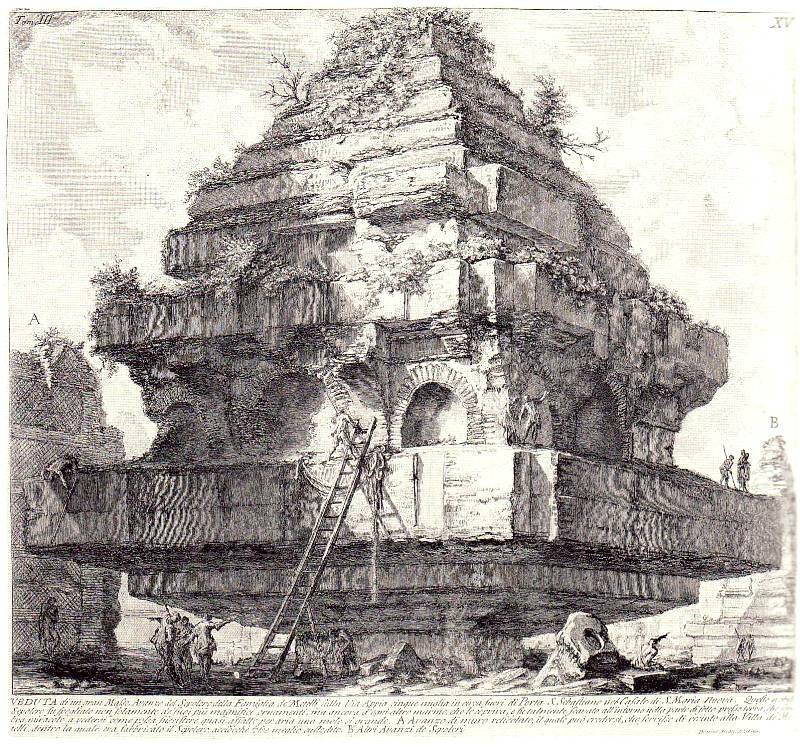 “His prints ‘showed’ things in an unprecedented and unimaginable way… [they] revealed a previously unknown aspect and represented a totally unknown world that, notwithstanding the precision of his rendering, was loaded with an extraordinary forceful charge of information” (p8). Tomb of the three Curatii brothers in Albano. Click image to view larger version. 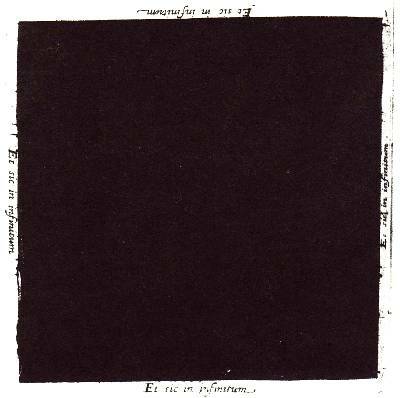 “Over the course of their formal evolution, a forest of new content appeared — cryptic, symbolic, allegorical and synthesized into an extremely pictorial vision that could simultaneously appear to be a decorative whim or a mine of recondite meanings, while the initial subject, neutral in itself, was transformed into a composition. This was a game of intentional ambiguities that could function differently according to the disposition and critical capacity of the observer himself” (p24/5).